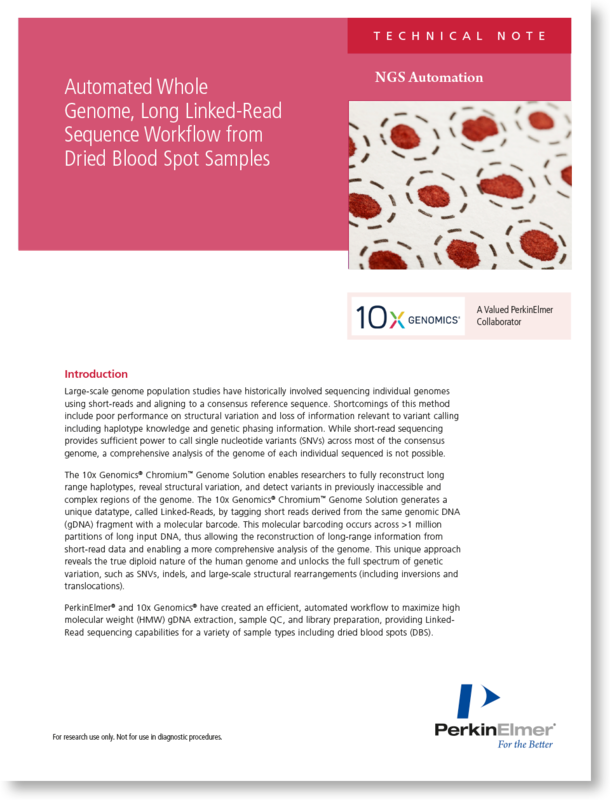 Dried blood spot (DBS) collections are an invaluable source of DNA for genomic screenings and population surveys. The high stability of their DNA, their simple handling and transport, and the minimal collection effort make DBSs an attractive alternative to the use of other sample types for many genomic studies. The drawbacks of using DBS as a source of DNA for genetic screenings lie in the difficulty of retrieving high molecular weight pure DNA in the concentration ranges required for most genomic applications. PerkinElmer offers solutions for the optimized high-throughput DNA isolation from DBSs based on its proprietary magnetic beads technology coupled with automated NGS library preparation. By avoiding chemically aggressive extraction procedures, the combination of PerkinElmer chemagic™ instrumentation and kits allow researchers to obtain high yields of pure DNA with minimal damage to the nucleic acid molecules, making it possible to perform routinely the most complex genomic analyses on DBS DNA. For more information, please download the application note or contact us.